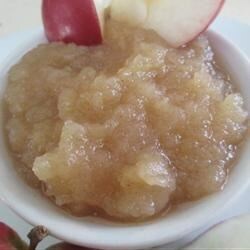 "An easy, quick applesauce recipe. I have doubled it and canned it so we always have some on hand. My family loves it." In a 2 quart saucepan over medium heat, combine apples, water, cinnamon, and cloves. Bring to a boil, reduce heat, and simmer 10 minutes. Stir in sugar, and simmer 5 more minutes. Delicious flavor. I did blend mine in the food processor and I found that it cooked better when I covered the pot with a lid. Overall great recipe and exactly what I was looking for! This recipe turned out kind of chunky and that's *exactly* what I was looking for. Very simple, very easy, very TASTY! Thankyou for sharing.